XML is a versatile and widely used data format. There are hundreds of tools, software and online services accepting XML as a primary format of imported data. What to do when you only have DBF? Just export your DBF files to XML. Here is how you can do this with DBF Viewer 2000. Run the program. 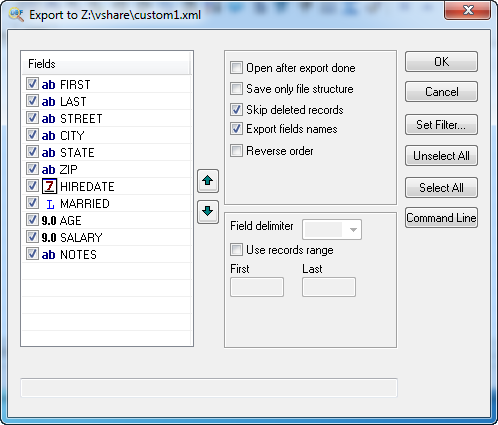 Open File | Save as/Export menu, and select XML as a file type. The export dialog box opens. Select the fields you want to export and specify their order using the up and down arrows. Do you need other options for XML generation? Please, contact us by E-mail: support@dbf2002.com or by On-line form.